Books may be one of the few things that get me more excited than shoes. Several books to get my heart racing, four of which are about Alexander McQueen, were released in the last month. Just in time for thinking about Christmas presents too. 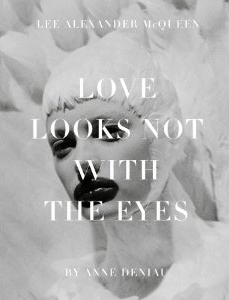 Love Looks Not with the Eyes: Thirteen Years with Lee Alexander McQueen, contains the photography of Anne Deniau, the only photographer allowed backstage at McQueen's theatrical shows. With so many McQueen books being released at once, this is the only one to feature completely original photographs. One of my complaints with earlier books on McQueen is that they didn't cover all the shows. His controversial graduate show and his most recent shows were covered ad nauseum, but there are shows from the 90s I've still never even seen. Alexander McQueen: Evolution seeks to rectify that by covering all 35 of McQueen's meticulously thought out dramas. Vogue on: Alexander Mcqueen contains many of Vogue's editorials featuring McQueen's always stunning creations. Behind the torn lace and wicked corsetry was a genius of humble beginnings. Alexander McQueen: The Life and the Legacy focuses on the man who made the art. More words. Less silk. For those of you not in love with the work of Alexander McQueen why are you here?, W just released a stunning 40th anniversary retrospective aptly titled W: The First 40 Years. We think W blows Vogue out of the water when it comes to editorials. Sure there's plenty about the fashion and art elite, but the photos. The photos! Speaking of photos, world renowned photographer Mario Testino, recently held in Shanghai an exhibit of his work. You can own the catalogue, Mario Testino: Private View, thus covering your coffee table with some of the most famous images of the last 25 years. Did you watch The September Issue? If so, you probably fell in love with Grace Coddington, the flame-haired former model turned creative director of Vogue. Well, she's loving us all back with Grace: A Memoir. The secrets! I must know them! All of these books are under $50, perfect for the fashion blogging, rabbit owning, Hoosier, fashion nerd in your life.